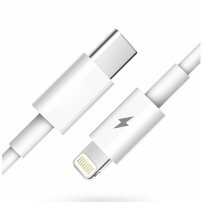 6.6ft / 200cm USB-C Power Delivery to Lighting Cable for iPhone / iPad (Fast Charge / Data Cable) : allputer.com - Accessories for all your Portable Electronics & Computers! - Net Weight: 35g approx. - Product Length: 6.6 feet / 200cm approx.